There’s something about pixel art that does not grow old. Sure, there are many amazing works of art that can blow pixel art out of the water, but the charm of this style has a timeless quality. Not everyone may appreciate pixel art, but if you love it, and you have an iPhone, an iPod Touch, or an iPad, you’ll want to hear about this new pixel art app. Called Pixeller, the iOS app is basically a paint board which allows you to exercise your creativity and make pixel art wherever you are. Pixeller was developed by Kit Da Studio, which is based out of Hong Kong. The app has two screens: the Gallery and the Pixel Editor. 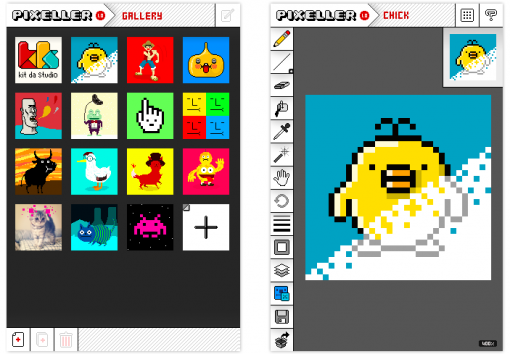 You need to use Pixellator’s Pixel Editor to create and edit your art. You will find various tools you need for this: pen, eraser, fill, and so on. There are quite a lot of tools which you can choose from, depending on how complicated you want your pixel art to be. The Gallery, on the other hand, is like a file folder where you can manage all your art. Create, edit, copy, and delete to your heart’s content! Pixeller is very new and is available at the App Store for $1.99. If you can’t resist pixel art, why not give the guys of Kit Da Studio a hand, and try Pixeller out? Here’s a video showing the app in action in case you want more visual information.